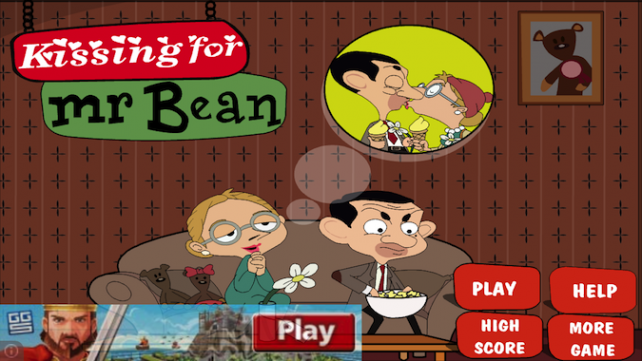 Kissing For Mr.Bean Version (Free) by cecil kennedy is a reflex game that lets you steal a kiss or two. Normally, stealing a kiss is something sweet and spontaneous. It shows the other person that you don’t need a reason to show them some affection. It usually doesn’t involve a covert operation to leave a peck while the other person is distracted and won’t notice. However, this is the famous Mr. Bean that we’re talking about. For any readers who don’t have a clue who that is, allow me to elaborate. 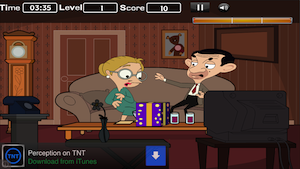 Rowan Atkinson plays the hilarious and socially backward Mr. Bean. He doesn’t care about social conventions at all, which leads to some rather uncomfortable situations. The humor behind Mr. Bean comes from his inability to properly interact with the people around him. This includes his girlfriend. In fact, I’m not entirely sure that Mr. Bean is aware that he’s in a relationship. Irma Gobb, for reasons that I can’t fathom, is in love with him. According to the Christmas special, she wants to marry him. However, if she wants any sort of affection, she has to wait until her boyfriend isn’t paying attention to what she’s doing. 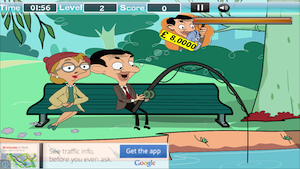 While Mr. Bean is daydreaming, tap the screen to let Irma give him a kiss. Hold your finger on the screen for as long as he’s distracted. Once the daydream starts to fade away, lift your finger to end the kiss. The longer the kiss lasts, the more points you rack up. There’s a meter in the upper right corner that will keep track of how many points you have. The first level is divided into three parts. When you reach a certain amount of points, the scenario will change. You begin with sharing a snack on the couch. The second phase is while you’re both watching a movie on TV. The third scenario is while Mr. Bean is on the phone. After you complete all three scenarios, you move onto the next level. Each level has a specific time allotment. The first level has three phases, so it has the longest time allowance. I’m glad to say that by the third level, Mr. Bean willingly accepts your kisses. The problem is that the police officer and old lady standing near you aren’t too thrilled about your public displays of affection. Make sure you’re only kissing when they’re looking away. I love Mr. Bean. I think he’s the most hilarious character I’ve ever seen. I also love that the app is family-friendly. Kids and adults alike can enjoy this app. The app is also simple enough that most age groups would be able to actually beat the app instead of just playing until it gets too difficult. 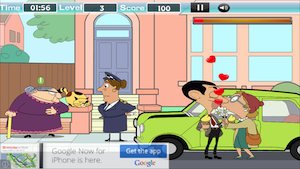 Kissing For Mr. Bean is a universal app, and it’s available in the App Store for FREE!